Remember last week I told you I was going to test something new? I started sending my entire message in an e-mail… instead of sending you a short teaser e-mail to get you to click through to a blog post. I was inspired to try it after Reading Ben Settle’s new “Street Smart E-mail System” course. It’s working KILLER in one of my niche businesses. 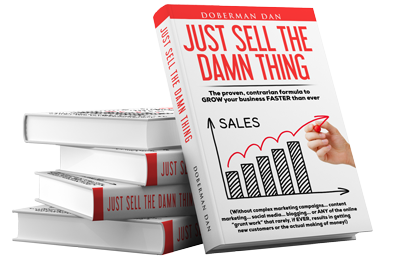 July is always a crappy month in this particular niche… but so far, this technique has DOUBLED my sales from e-mails. It will be exciting to see what happens after Labor Day when sales come back to normal. But I’m still not sure if I like doing it for my DobermanDan.com subscribers… for a couple reasons. First, I’m worried about being an annoying pest instead of a welcome guest. And second… I miss the comments on the blog. They’ve gone way down since I started this test. It’s probably just an ego thing but the comments let me know SOMEBODY is listening. I read every one, even if I’m not able to respond to them all. Most people are really nice and it’s a high point in my day. Geez… maybe I really DO need a shrink! Anyhoo… I’ll continue this for a while and see how it goes. Hey, I’ve been thinking about something the past few days and I’d like to share it with you. In the past (actually the very recent past) I’ve been guilty of trying to change people. I did it out of love because I don’t like to see people I care about not living up to their potential. So I did some things and said some things with the hope I could motivate them and turn them into “go-getters”. Unfortunately, they’re not, never were… and sadly, probably never will be. They seem to be content to settle for mediocrity for themselves and their families. That doesn’t make them bad people. They’re my friends and I love them. But I think pressure from me (even though it was subtle) was putting a strain on our relationship. They don’t want to change or improve their lives. If they really DID, they would be taking actions to do it. And nothing I do or say will change that. It’s true what Thoreau said… most people live lives of quiet desperation and die with the music still inside them. So I’ve discovered (the hard way) that trying to change someone is a complete waste of time. In fact, the very idea that you’re trying to change someone is saying that they’re not good enough as they are. And it reeks of judgment and disapproval… and those thoughts will only bring separation between you two. Instead, you have to look for the good in people… and when you do that, almost miraculously, more of it appears. It’s a simple principle… whatever you focus on, you get more of. If you only look for the good in people, you’ll be amazed at what your new focus reveals. P.S. Do you agree? Disagree? Think I’m wasting my time with these articles? Tell me your thoughts in the comments box below.